PrenatalSAFE®Karyo test is performed on a maternal blood sample which contains DNA (genetic material) from both the mother and fetus. It is available for women who are at least 10 weeks pregnant. The physical risk to you of obtaining the blood sample is usually minimal. This test uses a technology called "Massively Parallel DNA Sequencing" to count the number of copies of these chromosomes and then uses a calculation method to determine if there are too many or too few copies of these chromosomes present in your fetus. 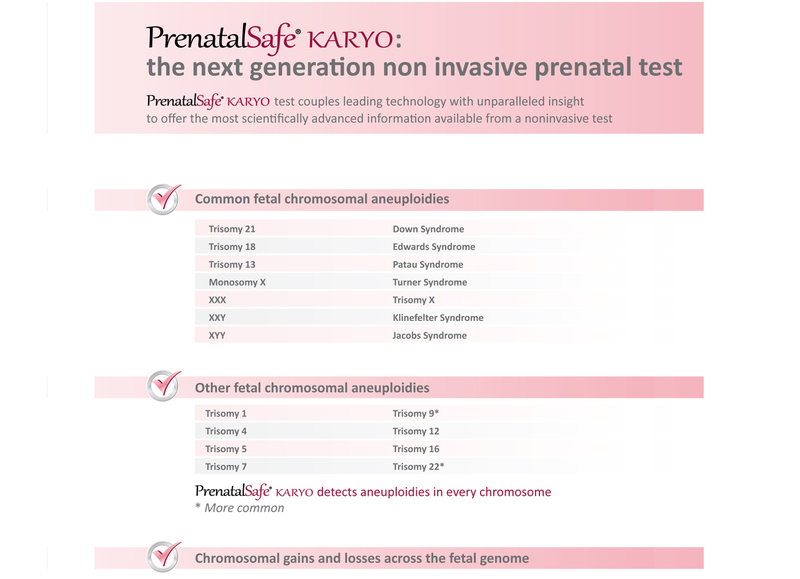 PrenatalSAFE®Karyo test analyses every chromosome in the genome, providing karyotype-level insight. It provides information about gains or losses of chromosome material ≥ 10 Mb across the genome. 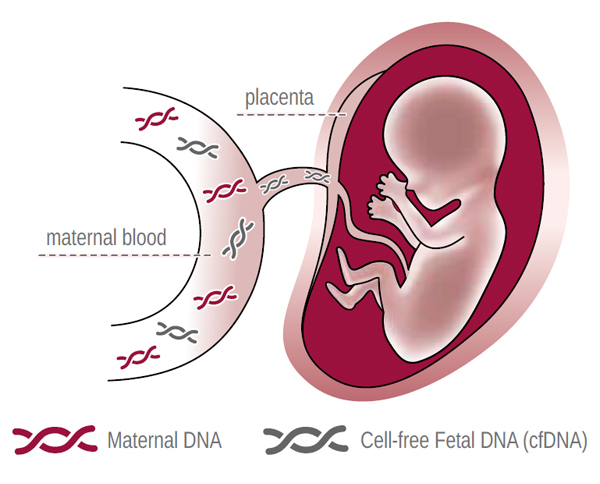 The test is performed on a maternal blood sample which contains DNA (genetic material) from both the mother and fetus. It is available for women who are at least 10 weeks pregnant. PrenatalSAFE®Karyo test is comprehensive, user-friendly and available for shipping directly to you or your healthcare provider. Once we receive your order request, the test-kit will be dispatched within 2 working days. The Test Kit contains everything you may need for blood sampling, together with instruction for sending the samples to our lab for testing. If you need further assistance please get in touch with us. Test results will be ready from 5 business days. The medical reports are sent via e-mail. You can also access the result through a secure online portal.